Shalford, Surrey, Kings Road circa 1912. 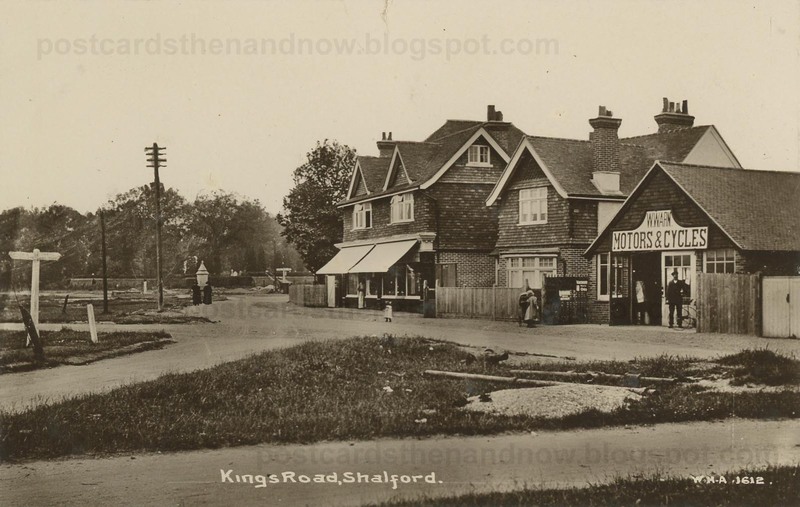 Shalford is between Guildford and Godalming. On the right you can see William Warn's garage. That may be Mr Warn standing outside. He is next to an old tricycle. His garage has long since been replaced by the building occupied by the Red Biddy Gallery in the modern Google Street View. Postcard published by W. H. Applebee. Click to enlarge. What a perfect angle you managed to get for the Google Street View comparison shot! I agree. I wonder what happened to the cycle shop. You do seem to find the most artistic and well-matched Google shots. This still looks like a great place.